Existing buildings often have limited space in the mechanical room to bring in new equipment to replace products that have reached the end of their useful lifespan. 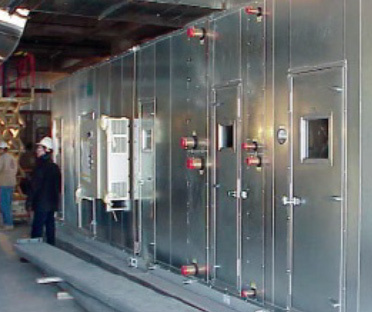 Our site Assemble AHU's provide a cost-effective way to bring the components structure and panels of the AHU piece by piece for site assembly. Each of the components can be sized with consideration for the available space. Our team can provide site assembly supervision to guide the installation team through the assembly and installation process. There is multiple site assemble solutions available including individual palletize components labeled with installation assembly instructions. Alternatively, the AHU can ship assembled with minimal fasteners and fixings for disassembly labeling. The pieces are then brought in for reassembly in AHU mechanical room. In addition, the performance of your new system can be realigned to match the current capacity and airflow requirements with advanced technologies such as FANWALL®. Downtime is often a critical issue for facilities and with our site assemble air handling solutions you can be up and running within two days with a brand new high efficiency, quiet, custom AHU system.